A drawing of a bird's-eye view of a broad river with a chain ferry in the foreground carrying oxen and a herdsman, who raises a stick to strike one of the beasts On the right is a bank with a landing-stage on wheels pushed out into the water. Beyond, the river winds among fields and trees. There is no suggestion of a horizon. Melzi's 133. 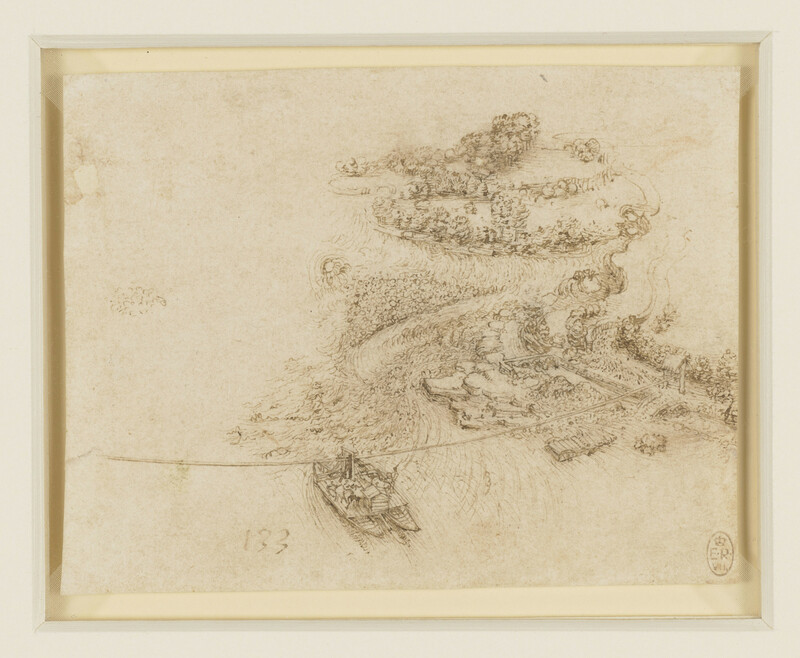 Leonardo drew his most exquisite landscapes while staying at the family villa of his pupil Francesco Melzi, at Vaprio, east of Milan, around 1512. This drawing was made from a window in the villa, the river Adda flowing towards us over a series of shallow rapids. The minuteness of the drawing testifies to the precision of Leonardo’s touch – and eyesight – even as he turned 60.